The Unromance of Maturity – Love. Life. Practice. A while back I wrote a short story for an editor for an anthology. She liked the story, but she had one complaint: the anthology was supposed to be focused on romance, and there wasn’t enough of that between my main characters. Long, smoldering looks where nothing is said. That’s it. I added those three things – quite literally and deliberately (He looked at her, intently, saying nothing for a long while. Then he turned and walked away. “What does that mean?! ?” she thought desperately…) and re-submitted it to the anthology. The editor loved it. Of course the object of her affections objected (as objects are wont to do). He swore he would never let her go, that he would protect her from whatever came their way, that he wasn’t going anywhere. And that’s when I felt the weight of maturity settle on my shoulders, because I realized that at the age I am, my response to her tirade would have been: “Oh. Ok, then. Nice to meet you!” and then to leave. I mean, come on – first of all, there’s the issue of consent. “You need to stay away from me” is pretty direct. Shouldn’t he respect her wishes? And if he does respect her and her judgement, then “nothing but trouble” and “nothing good” should be pretty clear warning signs. Personally, I would take her at her word and let us both be on our merry way. It’s not very romantic, I know. Romance dictates that she means the opposite, or that there is some magic to love that makes it worth the trouble. To be fair, I’ve been on that side of things more than once. There is definitely a bond that comes from working through trouble together – but I believe that comes from external troubles – for example, when a girlfriend and I kept having our cars serially break down. We had to stay together because we were each other’s ride to work…and working with Natasha as she begins to win her battle with depression has proven to be immensely worthwhile. I haven’t always been this way. I recall very clearly a moment when a young woman walked into a room at a party I was at, and when our eyes met, I thought She’s going to make my life complicated. And you know what? I was right. She’s a lovely individual, and we had some good times – but in the long run, we caused each other a lot of stress, a lot of anxiety, a lot of practical problems (it was a long-distance relationship) and in hindsight I can say that most likely we didn’t really gain much from our experiences with each other. There are some who use the term “drama” as a negative in terms of partners: She’s got too much drama. I’ve never been a fan of that term, because guess what? 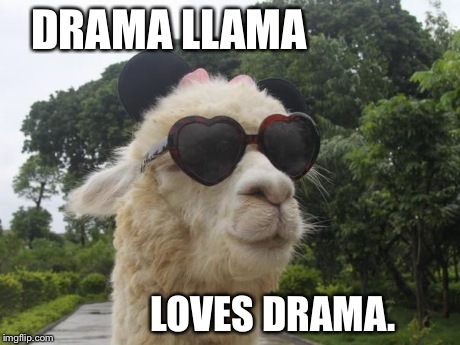 Drama is what life is. It’s got ups and downs and tragedy and triumph and a lack of “drama” is called “stagnation.” It’s not fun, it’s not interesting. But like movies, there’s gratuitous and there’s plot-driven drama. I’d like to think that the latter is what makes life more worthwhile. Maybe that’s mature romance. It’s not about fighting each other’s natures, but rather it’s about complementing each other to create something bigger, better, something more capable of dealing with “drama” than you can alone. That may be the true meaning of Love conquers all. Of course, it’s all much easier said than done. When anyone of any age is smitten, it’s less about logic and all about neurochemistry, and we all do dumb things. That’s part of the journey, and it gives us those stories to tell our kids as we watch them do the same damn thing. Go, lemmings, go!